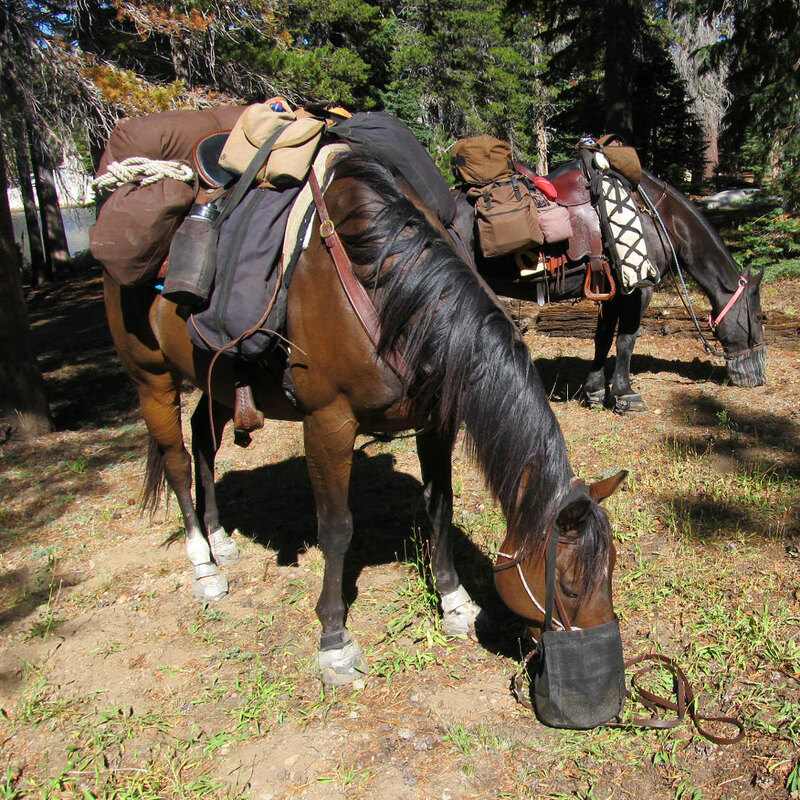 Not all horses are equally well suited to face the challenges of the Pacific Crest Trail. The selection of stock for a PCT ride is more matter of individual abilities than breed. Many different breeds have successfully ridden the trail. You want a horse or a mule that is strong and in good condition, is sensible and steady. It should have as much trail experience as possible. This should be on rough and challenging trails, not smooth, well-maintained trails. Don’t choose a horse that has spent his life in a stall and paddock with access to only a smooth pasture. Look for a horse that has been on very rough terrain with holes, mud, steep and slippery slopes, rocks, fallen trees, etc. This fine-tunes his sense of balance and teaches him where to place his feet. Be sure that your horse is in good physical condition before starting on the PCT. The horse that you select for the trail should have good feet and be athletic, sure-footed and agile. He should have good endurance. He shouldn’t regularly stumble. Your horse should be mountable from either side and should be able to head off alone without objection. You don’t want a horse that spooks easily along roads or if confronted by other animals. What will he do if suddenly confronted by a horse-eating stump, boulder, dumpster, or plastic blowing in the wind or an open grate bridge deck? How about a bear, deer, elk, grouse suddenly taking flight, goat, cow, rattlesnake, llama, bicycle, motorcycle, truck, or ATV? Try to introduce your horse to as many of these as you can before taking him on the PCT. You aren’t likely to find the perfect horse — but try. You will need to have your horse well shod or wear some kind of hoof protection. Some have used hardened iron shoes with either borium spots or titanium studs to improve traction and extend wear. Others have successfully used Easy Boots or other horse footwear. A practical rule of thumb is that a horse or mule should not carry more than 20% if his weight. The weight carried may vary with the terrain, pace, and the animal’s conditioning. You may want to consider planning short days after resupplies when your load is heaviest. Remember, you can always ease the load on your horse by getting off and walking. Besides, you’re likely going to want to walk some stretches anyway. It’s nice. Lighten up and think like a backpacker when selecting supplies for a trip. You really don’t need that cast-iron skillet! If you decide to travel with a pack horse or mule be sure to get qualified instruction on the specific skills of packing. Don’t ever hard-tie your pack animal to the back of your saddle. Make sure your animal’s packs are balanced. Either hold the lead line or use a breakaway string in case of emergency. Serious accidents and deaths have happened when pack animals have been secured to mounts. Be wary of using a back yard riding horse with little or no packing experience as a pack animal. A riding horse takes cues from his rider and gets his encouragement from that rider. Taking the same horse and expecting it to understand not to cut switchbacks, not go on the outside of boulders at ledges, etc. is unreasonable – and dangerous. Traveling on narrow mountain trails with a pack animal can be hazardous. Switchbacks can be especially dangerous. Be extra careful – even experienced pack animals have lost their lives. More horses can mean more impact. Traveling with more than one horse will require you to skip some camping opportunities that a smaller team would be able to take advantage of. It is safer to ride with a companion rather than solo. Riding with a pack animal, or sharing one with a companion rider, can considerably extend one’s range between resupplies, or allow for more feed to be carried thus lessening impact on graze.